According to the USGS Water Science School, the Earth's surface is 71 percent water, and 96 percent of that water is in the oceans. While some seabirds, such as petrels and albatrosses, have a special gland in their bodies that enables them to drink seawater, most birds need freshwater to survive. Unfortunately, of the remaining four percent of the Earth's water that is fresh, a great deal of it is trapped in the ice caps, glaciers or underwater sources that are inaccessible to birds. Other water sources may also be unreachable to birds, such as powerful waterfalls that songbirds cannot use or deep pools or swift rivers without accessible ledges where birds can perch. Because all wildlife needs water, predators often stalk water sources, and pollution and erosion can also make water sources less suitable for birds. Carefully chosen and thoughtfully maintained, however, bird baths or other backyard water can be perfect for birds. Despite its relative scarcity, birds need water just as much as humans do. Drinking water helps regulate body processes, improve metabolism and keep birds healthy. Birds use water for preening and bathing, and on hot days, standing in cool water or taking a quick splash can help birds keep cool. While wild birds can – and do – take advantage of many natural water sources, from puddles and streams to lakes, rivers, ponds and reservoirs, backyard water sources are equally valuable. In fact, a backyard water source is often even safer, since there are fewer natural predators and the water can be kept cleaner and fresher, helping birds stay cool, preened and healthy. Bird Baths: Bird baths are available in a wide range of designs, from simple dishes or shallow basins to more elaborate sippers or beautiful, artistic options. Baths may be placed directly on the ground, elevated on pedestals or even hung. Sizes, depths, shapes, colors and materials all vary, and there is a basic bird bath that can fit any yard size, or garden décor or backyard birding budget. 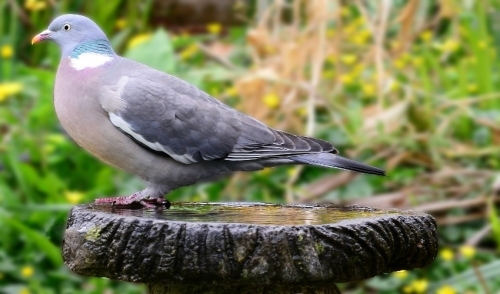 Fountains: Bird fountains are larger baths and include an element of movement. Bubblers are small and compact, while larger fountains may have one or more dribbling streams. The water's movement minimizes algae growth and disrupts any breeding insects. Furthermore, the splashing sounds and sparkles from moving water help attract more birds' attention, bringing them to the yard. Water Features: The most elaborate of all backyard water sources for birds are integrated water features. Ponds, waterfalls and backyard streams can all be incredibly valuable as part of a bird-friendly landscape, and they most closely mimic the natural water sources birds are familiar and comfortable with. Properly designed, these features are not only moving water to attract birds as well as an appropriate source for drinking or bathing, but a backyard water feature can also be a food source with plants, fish, amphibians and more. While these features may be out of the question for tight budgets, they can provide inspiration for all sorts of bird-friendly backyards. No matter what type of water is offered in the backyard, birders need to take care of it to be sure it is helpful instead of harmful to birds. Clean baths regularly, removing all debris and algae, and ensuring there is no toxic contamination for soaps, pesticides or other chemicals before refilling the bath. Take steps to keep baths safe from predators, such as providing nearby brush piles for birds to retreat and positioning the bath away from areas where predators may hide. Keep the bath filled with fresh, clean water, refilling as often as necessary after birds splash or evaporation lowers the water level, otherwise small birds will not be able to drink. Any water feature can be an amazing addition to a yard, and whether it is a simple basin, a stately fountain or an elaborate waterfall and pond, the birds will love it. Once backyard birders see just how many birds are attracted to water, they'll be thirsty to add even more water sources to the yard.